General background. Jim Butler has been an Northern Virginia resident since 1990. He currently lives near Lincolnia in Falls Church. His son Jeff and grandson Mathis live in Natchitoches, LA and his daughter Emily lives in Richmond, VA.
Coach Butler is a native of Seattle, Washington and a graduate of the University of Washington where he earned degrees in Business and Political Science; he also earned a Masters of Tax degree from Georgetown. 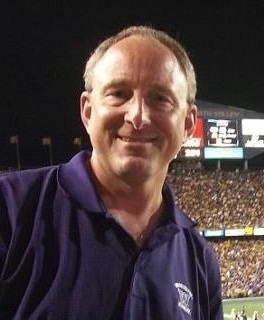 Coach Butler works at Blackboard Inc, where he started working in November 2010 as the Director of Tax Compliance. Coaching experience. 2011 is Coach Butler’s tenth year coaching for the Matrix since he founded the Matrix in Spring 2003. He also coached Fairfax County Youth Basketball League ("FCYBL") travel teams during most of those years. Most recently, Coach Butler led the 2011 Matrix 2018 Black team to a 7th place finish in 5th Grade D-II AAU Nationals in Hampton, Virginia. The team then finished undefeated in the Maryland Flames 2011 Fall League against 6th Grade D-I and 7th Grade D-II competition. Coach Butler will be staying with the team as they compete as 6th graders in 2012. Coach Butler took a break during the 2011-2012 FCYBL season, but during the 2010-2011 season, he capped a three year stint with the same McLean team, the McLean Blaze, as they took home the 7th Grade, Division I FCYBL championship, the first McLean Girls D-I title in well over a decade. In the prior FCYBL season,they were the FCYBL regular season champions, tournament runner-up and 2010 BRYC 12U Division 1 Thanksgiving Tournament champions; Coach Butler was also voted Most Valuable Coach by his fellow coaches. Coach Butler has been coaching boys and girls youth basketball in Northern Virginia for 13 years. Prior to coaching at the select-level, he coached the Fiery Dragons out of Glebe Elementary School in Arlington for six seasons. Jim also has coached baseball and boys basketball. Coaching philosophy. Coach Butler’s philosophy is to teach young student athletes the game of basketball through individual skill development, focusing on basic fundamentals of the game and teamwork. His aim is to prepare all his players to be productive at the next level, be in on the court, in the classroom and/or any other aspect of his players’ lives. Coach Butler’s brings a disciplined, no-nonsense approach to every practice and games – effort, hustle, intensity and a passion for the game are a must on any Coach Butler team. He likes a pressing, up-tempo game and man-to-man defense. Offensively, Coach Butler is one of the many Matrix coaches using the Read & React offense, which can be implemented against both man and zone defenses. One huge advantage of this offense is that the players don’t learn “set plays”; rather they learn the rules of the offense and then “read” the defense and “react” using their own judgment rather than a scripted set offense. Not only to the players love this offense, but it’s proven to be very effective. While Coach Butler plays to win and likes to win, his approach is that if the girls “Play hard, play smart and play as a team,” that’s all you can really ask of your team. Plus, if the players and the team consistently achieve these three goals, the game scores and wins and losses will take care of themselves. AAU basketball. Jim is the founder and Executive Director of the Matrix; click here to learn more about the founding and history of the Matrix. Coach Butler also serves on the Executive Committee of Potomac Valley AAU Girls' Basketball, a position he has held since 2007; he is also the webmaster for the Potomac Valley AAU Girls' Basketball website. Other youth sports background. Other youth sport experience Coach Butler’s background includes coaching and/or assistant coaching Cal Ripken baseball and Arlington Senior Babe Ruth baseball for 7 years, serving on the Board of Directors for Arlington Senior Babe Ruth for 3 years, creating a coaching tips manual for Arlington Cal Ripken, and assistant coaching Arlington Optimists soccer for one season. Coach Butler also created the websites still used by Arlington Cal Ripken and Arlington Senior Babe Ruth and the FCYBL's current website. He also assisted the Arlington Girls Softball Association with the reorganization of their website and managed the Arlington Travel Basketball website for four years. You can e-mail Coach Butler at .